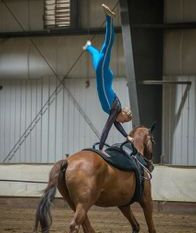 The Meadow Creek Vaulting Club puts a focus on providing only the highest standard of coaching, for all levels of classes. Jeanine is the Head Coach at MCVC. She has 15 years of coaching experience at all levels. Her attention to detail and eye for the technical requirements in vaulting set her aside as both a High Performance coach, as well as Introductory level coach. Jeanine is also an active competitor herself, having represented Canada at 5 World Equestrian Games and World Championships in Individual, Pas De Deux and Squad vaulting. She's a 5 time Canadian Champion in the Womens event, 4 time Canadian Champion in Pas De Deux and 2 time Canadian Champion in Squad. Angelique is the Head Lunger at MCVC. She has been lungeing, coaching and training horses for 15 years. Her specialty is training vaulting horses for all levels in our programs, and she oversees all of our equine needs. You will always find her working on developing our horses at MCVC to reach their full potential. Occasionally Angelique will also coach at training. Angelique is also an active vaulter herself! She's competed for Canada in both Pas De Deux and Squad at the highest level. Angelique has several National titles in Pas De Deux, and also achieved top 10 placings at the World Equestrian Games! Dallyn is one of our Junior Coaches at MCVC. She has been coaching since she was 13 years old. One of her future goals is to become a vaulting lunger and she's working hard towards this. Dallyn is also a high level vaulter! She competes in the Individual Junior class, as well as the Pas De Deux and Squad. Dallyn has already represented Canada at the 2014 WEG, 2017 Junior Worlds and 2018 WEG - and she's only 16 years old now! Dallyn is a very well-rounded high level athlete that continues to inspire our young vaulters at the club!